The earliest scholarship on food in American art was carried out by scholars of still-life painting, a genre that prominently features food. William Gerdts, Wolfgang Born, and Alfred Frankenstein are a few of the pioneer art historians who studied the earliest painters of food in this country.1 A second generation of scholars has taken up that torch, studying food within the context of culinary-oriented decorative arts, material culture, and natural science, as well as the body. But apart from a small camp of scholars, food—and more broadly, the sense of taste and its relation to aesthetics in American art—has gained little attention. Food has been dismissed as a mere accessory in visual representation. That renderings of food often decorated the dining room further perpetuated stereotypes of the subject as superficial and empty of theoretical meaning. But the representation of food has always been central to human experience. The consumption of images has often been intertwined with and understood through gustatory metaphors. These papers, drawn from our cochaired session, The Gustatory Turn in American Art, at the College Art Association 2017 Annual Conference, illustrate how artists and viewers have used the platform of food to investigate connections between aesthetics and social politics. Katherine Manthorne aptly demonstrates this point with the raisin, one of the most important California commodities and a loaded subject that expresses attitudes about the cultural exchanges between Spain, Mexico, and California. The team of Sun-Maid Girls who paraded around the Panama-Pacific International Exposition represents the complex iconography of this fruit and the way that food marketing engages ideas about race, gender, and power. Manthorne concludes that the raisin is neither provincial nor insular, but is a remarkably global food and a perfect case study for tracing the transnational connections carried by visual representations. Aileen Tsui, in her essay, also presents a compelling case for how food serves art, providing several examples of the reception that paintings by James McNeill Whistler received in which his work was viewed through a culinary lens. When critics described his harmonies as “eggs and milk,” and criticized other paintings as unsavory as “licorice and tripe,” they demonstrated how gustatory metaphors structured the comprehension of Whistler’s abstract compositions. Although our understanding of Whistler’s nocturnes is often animated by the intermingling of visual and aural senses, Tsui finds that a more complete digestion of these paintings engaged a rich and unexplored symbiosis between sight and taste. Food allowed critics to describe the properties of color, paint, and texture where art and musical terms ultimately failed. If food could be so useful for contemplating art, then what happens when art engages with the subject of a paucity of food? How do artists communicate ideas about hunger and starvation? To this end, Lauren Freese explores how painters exposed the heartbreaking conditions of the American poor in nighttime abstractions that are starved of food and color. Despite their often impenetrable darkness, these paintings and prints in the so-called Ashcan style illuminate the way that breadlines and soup kitchens articulated early twentieth-century tensions about gender roles, labor, and social control. Freese’s text reinforces how food was a form of sustenance and nutrition, as well as a gateway for artists and viewers to debate social reforms. The essay by Margaretta Lovell is a fitting one to conclude this section, illustrating the profound legacy of food photography and its contemporary variations. She exposes how food in glossy magazines is deliberately and strategically arranged: set in sharp focus, in aerial perspective, and with a conscious use of complementary and analogous colors. These photographs were designed to capture the culinary climax, just before the first bite is taken, amplifying that perfect moment of desire. Unlike the spare, colorless images of breadlines or the unappetizing criticism of Whistler’s paintings, magazine photographs of food share more in common with raisin advertisements of the past in the way they produce narratives that isolate the desire for food while occluding the processes of food production and preparation, along with those whose labor brings alluring meals to fruition. These essays advocate for serious and innovative scholarship addressing both the representation of food in American art and our understanding of how the sense of taste is inextricably bound up with processes of visual perception and cognition. This discussion is timely given the recent swell of food studies programs across the country, including those at New York University, the University of Toronto, and the University of California at Davis. There has also been a dramatic rise in the number of museum exhibitions devoted to food, including Sweet Tooth at Shelburne Museum, The Way We Eat at the Houston Center for Photography, Around the Table at the San Jose Museum of Art, and the landmark exhibition Art and Appetite at the Art Institute of Chicago.2 Gastronomica: The Journal of Critical Food Studies, published by the University of California Press, has made it a priority to include frequent contributions from art historians, including many who write on American topics. Contemporary artists are also grappling with food (often quite literally), such as Kara Walker, who created a giant, sugar-coated ceramic mammy sculpture, A Subtlety, at the Domino Sugar Factory in Brooklyn, New York, in 2014. The following papers presented on the theme of The Gustatory Turn mark another step forward in this effort to recognize how visual images reveal and produce an entanglement of food, culture, and people. Approaching food through the framework of art history reveals how images of food are not innocent or straightforward, but are instead ideologically loaded, reflecting and shaping national discourse. 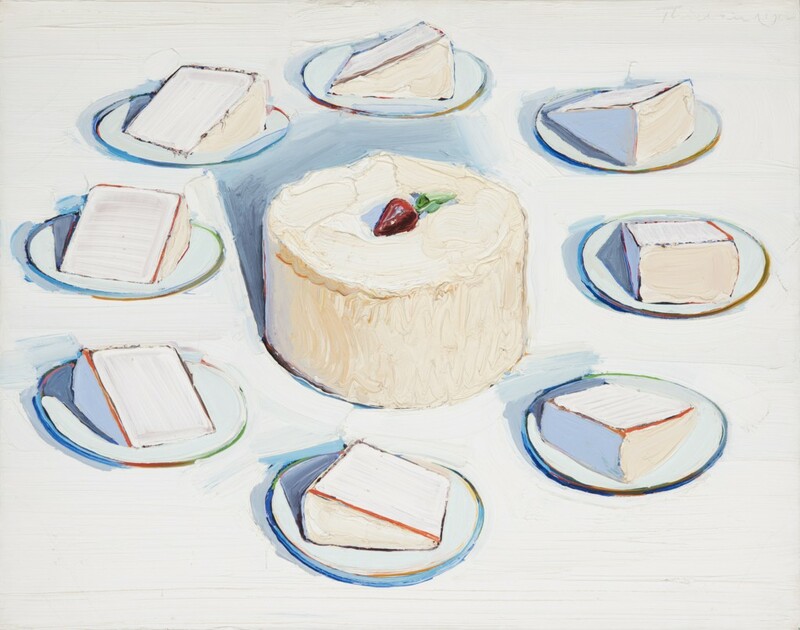 Pictured above: Wayne Thiebaud, Around the Cakes (detail), 1962. Oil on canvas, 22 1/8 x 28 1/16 in. (56.2 x 71.2 cm). Spencer Museum of Art, University of Kansas, Lawrence, Gift of Ralph T. Coe in memory of Helen Foresman Spencer; Art © Wayne Thiebaud / Licensed by VAGA, New York, NY. Cite this article: Shana Klein and Guy Jordan, “The Gustatory Turn in American Art,” Panorama: Journal of the Association of Historians of American Art 3, no. 2 (Fall 2017), https://doi.org/10.24926/24716839.1605. About the Author(s): Shana Klein is a postdoctoral fellow in Global and Trans-Regional History at the German Historical Institute and Georgetown University, and Guy Jordan is Associate Professor of Art History at Western Kentucky University.